BUCHANAN, New York, May 9, 2015 (ENS) – Indian Point nuclear power plant 38 miles north of New York City safely shut down as designed following a transformer failure in Unit 3 today. 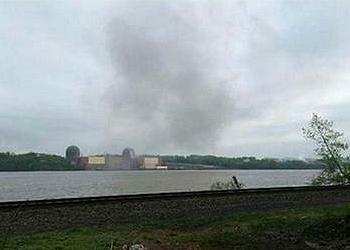 Witnesses reported a loud blast, and smoke was seen rising from the nuclear plant on the east bank of the Hudson River at Buchanan, New York. On Thursday morning, Indian Point control room operators removed Unit 3 from service following identification of a leak of clean steam from a pipe on the non-nuclear side of the plant overnight. Operators began reducing power around 7:00 am May 7, when they found the leak could be repaired only while the plant was shut down. Entergy said there was no release of radioactivity and no threat to the safety of workers or the public from the steam leak. Indian Point supplies roughly 25 percent of the region’s power, including power to New York City. BISMARCK, North Dakota, May 9, 2015 (ENS) – BNSF Railway Friday resumed shipping freight along the mainline track through the small town of Heimdal, North Dakota two days after an oil train derailed and caught fire there. The 109-car train was carrying crude oil from the Bakken oil patch in western North Dakota when six cars filled with about 180,000 gallons of oil went off the tracks and caught fire about 7:30 am Wednesday. Residents evacuated from the area near the derailment have returned to their homes. BNSF has established a Claims Center in the area to assist those who evacuated. The fires have been extinguished, and the BNSF team has removed a majority of the crude oil from the derailed tank cars. State Health Department Environmental Health Chief Dave Glatt estimated that 34,000 gallons of oil burned in the fire and 60,000 gallons spilled from the tankers. Cleanup continues of crude oil that spilled into nearby wetlands. Acting Federal Railroad Administrator Sarah Feinberg said the federal government has sent a 10 person investigation team to the site to investigate the cause of the accident. “Today’s incident is yet another reminder of why we issued a significant, comprehensive rule aimed at improving the safe transport of high hazard flammable liquids,” she said. On April 17, the U.S. Dept. of Transportation ordered oil trains to go slower than 40 mph in cities and also issued new safety advisory rules. This is the fifth train derailment and fire in the United States and Canada so far this year, including another BNSF oil train from North Dakota that derailed in a rural area south of Galena, Illinois on March 5. All of the incidents have happened in rural areas; none have resulted in deaths. SAN FRANCISCO, California, May 9, 2015 (ENS) – A new Marine Debris Campus Toolkit to help colleges eliminate plastic waste was introduced Friday by the U.S. Environmental Protection Agency, the Product Stewardship Institute, and the University of California. Funded by an EPA grant, the Toolkit project aims to reduce marine debris and coastal pollution. The toolkit was tested during a two-year pilot project by the Product Stewardship Institute at three coastal University of California campuses: UC Santa Barbara, UC San Diego, and UC San Francisco. During the two-year pilot project, all three UC campuses reduced their plastics use. UC Santa Barbara achieved a 97 percent decline in plastic bag use by campus food services through an agreement with their local Subway store to eliminate unnecessary packaging. By promoting campus hydration stations, the campus eliminated over 60,000 single-use plastic water bottles. UC San Diego cut over one million plastic bags each year by working with their campus Subway store to eliminate plastic bags and straw sleeves. UC San Francisco’s Parnassus and Mission Bay campuses retrofitted 50 water fountains with gooseneck spouts to fill reusable water bottles easily, cutting campus purchasing of single-use plastic water bottles by 50 percent.